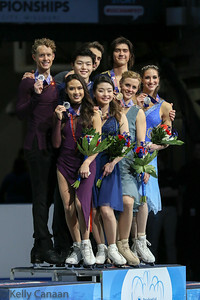 L-R: Evan Bates and Madison Chock, silver; Alex and Maia Shibutani, gold; Zach Donohue and Madison Hubbell, bronze; Alex Benoit and Elliana Pogrebinsky, pewter. 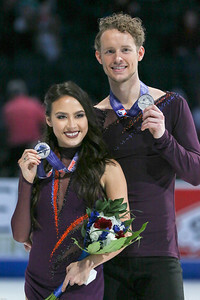 Madison Chock and Evan Bates hold up their silver medals at the 2017 US Figure Skating Championships. 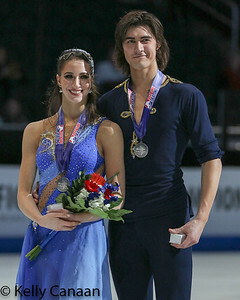 Elliana Pogrebinsky and Alex Benoit, 4th place finishers in ice dance. Maia and Alex Shibutani won the gold medal in KC. 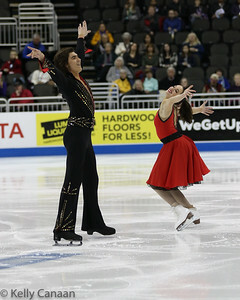 Alex and Maia Shibutani glide in unison during their free dance in Kansas City. Madison Chock and Evan Bates skated an intense and well-choreographed short dance to eventually win silver. Madison Chock and Evan Bates had a little fun in their short dance. They won silver. Nothing but smiles for Madison Chock and Evan Bates, who ended with the silver medal in Kansas City. Evan Bates and Madison Chock get ready to begin their free dance. Madison Chock and Evan Bates begin their free dance at the US Figure Skating Championships. They finished 2nd. Madison Chock and Evan Bates perform their free dance in Kansas City. Madison Chock and Evan Bates balance during their free dance in Kansas City. Madison Chock and Evan Bates hold steady during their free dance at the 2017 US Figure Skating Championships. They went on to win silver. Madison Chock makes eye contact while skating with partner Evan Bates during the free dance in Kansas City. Evan Bates and Madison Chock finish their free dance in Kansas City. They won silver. Madison Hubbell and Zach Donohue skate their short dance. They would go on to win bronze. Zach Donohue and Madison Hubbell, having a little fun in their short dance. Madison Hubbell and Zach Donohue finish with a flourish in Kansas City. They went on to win the bronze medal. Zach Donohue and Madison Hubbell skate during their free dance in Kansas City. Alex Benoit and Elliana Pogrebinsky have some fun during their short dance in Kansas City.